We're wrapping up our spring schedule and next up is our big Clean the Bay Day event on Saturday, June 4th. This year we will be supporting two sites: Indian River Park and Plymouth Community Park. Especially after this rainy season, there is a lot of trash wash into the parks and we're going to need lots of hands to help with the cleanups. We're also holding a volunteer appreciation picnic at Indian River Park immediately after the cleanup. Please RSVP to let us know you are coming. I'll be the featured speaker at our June meeting on the 16th with a presentation about Chesapeake Bay restoration efforts and the impacts and benefits on our feathered friends, including some colorful history and great bird photographs. And on the 18th we holding our Indian River Road and Bridge Garden Cleanup, rescheduled from the rained-out date in May. We look forward to seeing you. Plymouth Community Park at 701 Pond Lane (two blocks north of Border Rd). The Friends of Indian River's will be doing our cleanup along the stream buffer in Indian River Park, the headwaters of the Indian River, and at Plymouth Community Park, a small waterside park along the tidal section of the Indian River. This will help to spruce up the area, collect trash that will otherwise get washed into the river and impact wildlife. The city will provide garbage bags. We'll have water and snacks available. Volunteers from both sites are invited to a post-event picnic at Indian River Park. The Friends of Indian River will bring hot dogs, burgers, and drinks. We invite folks to bring a side dish like dessert, chips, pasta salad to share. To help our planning, please RSVP to info@friendsofindianriver.org, tell us which site you want to support and if you know you will join us for the picnic afterwards. (Last minute volunteers are still always welcome). At our next regular meeting, Rogard Ross will do a presentation on the past, present, and future of efforts to restore the Chesapeake Bay and the impact on bird life. Packed with colorful history and some great bird photographs, this should be an interesting presentation. There will be light refreshments and door prizes after the presentation. The meeting starts at 7 PM in the Social Hall at the Oaklette United Methodist Church, 520 Oaklette Drive. We'll meet at Oaklette United Methodist Church, 520 Oaklette Drive, Chesapeake, VA for our next quarterly cleanup along Indian River Road. (Park in the rear). This will help to spruce up the area, collect trash that will otherwise get washed into the river and impact wildlife, and give us the opportunity to interact with residents and businesses along Indian River Road. We'll also have a team do some gardening and maintenance around the bridge planters and the trees this morning, including weeding, and mulching. Let us know if you want to be on the gardening team. The city will provide garbage bags and orange safety vests. We'll have water and a few snacks available. Please wear closed-toe shoes, a hat and bring work gloves and other items that may be useful. Participants under 18 years of age must have adult supervision. Last chance to get your Chesapeake Notable Yards contest nomination in by May 31. If you have a yard to nominate, reply to info@friendsofindianriver.org and we'll make sure they are submitted. The City hosted a public meeting about Aqua Virginia on May 23rd to solicit public input from the residents. There seems to have been a good turnout and there are a few proposals on the table from Aqua Virginia and the City to deal with the fire suppression capacity issues affecting the Indian River Shopping Center and the adjacent community. We'll be encouraging both parties to move forward and find a workable solution. Stay tuned for more information. The next Chesapeake Recycles Day is Saturday, June 11 from 9 to Noon in Deep Creek. Bring your household hazardous materials, old electronics, Goodwill items, plastic bags, regular recyclables, and such. No old-style tube TVs, no tires; personal items only. Also they are collecting non-perishable canned goods for donation to a local food pantry. Due to the rain in the forecast for this Saturday, we are rescheduling the Indian River Road and Bridge Garden Cleanup to Saturday, June 18th, 9:30 am, meeting at Oaklette United Methodist Church. We hope that you can join us for the Clean the Bay Day Cleanup at either Indian River Park or Plymouth Community Park on Saturday, June 4th. We are also holding a post-cleanup picnic at Indian River Park that day. See below for more details. The BioBlitz at Indian River Park was a great success. 84 people came to explore the park and we documented over 100 species of plants and animals. You can find the full report at the link below. 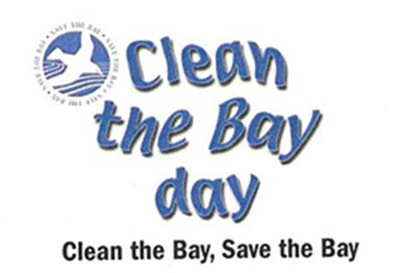 Now were gearing up to hold Clean the Bay Day on June 4th at Indian River Park and at a second new site - Plymouth Park on the west shore of the river. We hope you can come out and give us a hand and join us for the volunteer picnic afterwards. But first we have some important events, including a roadside cleanup, in May. At our next regular meeting, Kirsten Halverson will present on Buy Fresh, Buy Local There will be light refreshments and door prizes after the presentation. The meeting starts at 7 PM in the Social Hall at the Oaklette United Methodist Church, 520 Oaklette Drive. The Friends of Indian River's will be doing our cleanup along the stream buffer in Indian River Park, the headwaters of the Indian River and at a small waterside park along the tidal section of the Indian River. This will help to spruce up the area, collect trash that will otherwise get washed into the river and impact wildlife. The city will provide garbage bags. We'll have water and snacks available. The Chesapeake Notable Yards contest nomination deadline has been extended to May 31. We're looking for yards that aren't just pretty to look at but also follow environmentally conscious practices such as planting natives, having buffers to absorb run-off and reducing fertilizer and pesticide use. The winner fom each borough in the center will get bragging rights and win a $50 gift certificate. If you have a yard to nominate, reply to info@friendsofindianriver.org and we'll make sure they are submitted.